We’d love your help. Let us know what’s wrong with this preview of The Empty Spaces by Bianca Palmisano. The Empty Spaces is Bianca’s debut poetry collection, which touches on the most fragile joys and tragedies of modern life. From ethereal themes of love and beauty to the tiniest details of daily living, The Empty Spaces examines the moments that give our lives meaning and the way in which we evolve through them. To ask other readers questions about The Empty Spaces, please sign up. 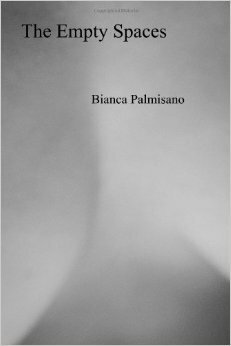 Bianca Palmisano’s debut collection offers readers an unflinching journey through all the highs and lows, the inspirations and mundane moments, of daily life. These insightful, personal poems swirl through the cold heaviness of foggy relationships and broken pasts, to the bright hope of new love. While unafraid to expose her own weaknesses and doubts on the page, Palmisano is also a poet filled with confidence and hope. In the poem “Last Moments,” she looks at the old dogs of society, stuck in t Bianca Palmisano’s debut collection offers readers an unflinching journey through all the highs and lows, the inspirations and mundane moments, of daily life. These insightful, personal poems swirl through the cold heaviness of foggy relationships and broken pasts, to the bright hope of new love. With sincere wit and insightful imagery, Palmisano mourns the bad and celebrates the good within her own life, and in the shared human experience. From dreary high school days to the JFK assassination to the difficult conversation of whether to have a baby with her partner, there’s no corner of life that the poet shies away from. The Empty Spaces exposes how the “hopelessly mundane” of daily life can weigh us down—and how the ecstasy of love can elevate those same old routines to something wonderful. Ultimately, I found this journey to be a challenge to rise above the unanswerable questions and struggles of life, to make something extraordinary out of everyday living. “Meet the snow with your accord,” Plamisano challenges her readers. “Be the flower that blossoms in the face of adversity.” Readers are sure to be touched, challenged, and inspired by this honest and relatable collection of poetry.